He was chosen to run for Great Britain in the 1924 Paris Olympics. Controversially he declined to run in that race because it was to be held on a Sunday. A devout Christian, he believed that running on Sunday violated the keeping of the Sabbath, something he would not do for king, for country, or Olympic glory. For the stand he took, Liddell was called a traitor. Immense pressure was put on him to run but he refused. He was instead given the opportunity torun in the 200 and 400 meter races. Winning a bronze in the 200 meters, he won the gold in the 400 meters, setting a world record as well. Returning to Scotland, he quietly finished his degree in science and theology, and then in 1925, returned to his native China to serve for the next twenty years as a mission partner. In 1936, as China prepared for war, Communist and Nationalist tensions increased. In 1937, Liddell was asked by the London Missionary Society to become a village evangelist in Siao Chang a more remote and hazardous region. By 1941, life in China was becoming so dangerous the British Government advised British nationals to leave. Liddell sent his wife, Florence and their children to safety in Canada but stayed behind Japanese lines to continue his work. In 1943, he was arrested and sent to Weihsien Internment Camp. He preferred captivity to freedom in order to reach the lost. Liddell was convinced that lost people matter to God.Are you? The parable before us today is actually the third in a series about ‘lostness’ recorded by Luke; the lost sheep, the lost coin, the lost son. There is a rising level of intensity and emotion from the lost sheep (1 in a 100) to the lost coin (1 in 10) to the lost son (1 in 2). The story we are considering today is known as “The Parable of the Prodigal Son” or “the Lost Son”. This description is unfortunate because it is an inaccurate interpretation. It draws our attention to the younger son. It would be more accurate to call this the “Parable of the Lost Sons”, plural, because both were estranged from their father. Both were lost. Both disrespectful toward their father. Both needed to repent and respond their Father’s love. And yet, even this misses the point. What is common to all three parables? Who is the central character of all three parables? Timothy Keller helpfully names this the parable of the Prodigal God. The word ‘prodigal’ is an old English word meaning ‘recklessly extravagant’ and ‘having spent everything’. Do you see? This is not primarily a story about a recklessly extravagant son who spent everything. It is about a recklessly extravagant God who gave everything in Jesus. Do lost people really matter to God? If lost people really matter to God why do they not seem to matter to the Church? If lost people matter to God, how can we ensure they matter to us also? The Pharisees and teachers of the Law were asking the very same question. The religious leaders found it incomprehensible that Jesus would want to spend time with ‘sinners’. That is because they did not know God or his compassion for the lost. Jesus makes this explicit at the end of each of these three parables. Each one ends with an act of joyful celebration. The Bible leaves us in no doubt. Lost people matter to God. He created them. They belong to him. He loves them. The Lord Jesus Christ came to seek, to find, to save and to celebrate with them. So, first question: Do lost people really matter to God? Yes! Unequivocally. Unreservedly. God’s passion is about providing a home for the lost. The passion of some churches today it seems is restricting access only to the found. Why this chasm? Why this disconnect? Why are some Christians it seems really not that interested in lost people? The critical attitude of the older son resonates with some church goers I meet today. They have never left home. They ask awkward questions. They challenge us to reflect on what we believe and why. Church used to be so uncomplicated before ‘they’ started to attend. Like having to change the church layout to fit them in. Like having to hold two Sunday morning services. The church was fine until ‘they’ started to turn up. They take photographs at baptisms. Their children are noisy. They don’t sing. They fidget and talk. Church services used to be so dignified until ‘they’ started to attend. And temptation is to retreat into a church ghetto, circle the wagons, and say, ‘become like us, don’t cause any trouble or expect us to change and then we will accept you.’ The assumption is that seekers need to behave when they come to church, believe and then they can belong. Behave – believe – belong. The pattern we see in this parable and throughout the gospels is the opposite. For Jesus it was: Belong, believe and behave. People need to feel welcomed and accepted before they will believe. When they believe in Jesus, he will take care of their behaviour. God’s passion, is to bring his children home. Do lost people really matter to God? Yes of course. If lost people really matter to God why do they not seem to matter to the Church? Perhaps because some Christians have not experienced God’s passion. In my previous church, our mission statement was ‘To know Jesus and make Jesus known”. The question is – how far do our activities reflect God’s passion? Is evangelism just one of our activities or is making Christ known central to all we do? How many of our special events are designed to bring people back to the Father? Do our services have the seeker in mind? Are we addressing the questions seekers are asking? What barriers have we erected which unintentionally make it harder for seekers to come home? We must be intentional about this. “So they began to celebrate. Meanwhile, the older son was in the field. When he came near the house, he heard music and dancing.” (Luke 15:24-25). The celebration could be heard from the fields. Do our activities appear so enticing to those outside? What words do you associate with church? Would celebration be on your list? Music? Dancing? The Christian life is one long celebration. One long shout for joy at the richness of God’s grace. In verses 17-19, it says the son came to his senses. He realized that he was better off as a servant in his father’s house than someone enslaved to his own desires. Memories of his father’s love and his former home life were highly potent. Put simply, thoughts of his father’s house beat the competition. Do you realise we are in competition with all the secular alternatives today. Sunday shopping, entertainment, recreation, sport. We have a message that beats the competition hands down. That is why we should be committed to excellence in all we do. There is no agency on earth to match these values but a group of fully devoted followers of Jesus Christ. Feedback shows that 4 out of every 5 people become Christians as a result of a relative or friend. Why? Why are you here today? Because very likely someone got close to you and was contagious. They expressed the love of God for you in tangible ways and God used it to soften your heart. Is that how you see new believers? Does Christ’s love compel you? Transform you and the way you view others? Never forget the magnitude of God’s love for you, turning you from being a stranger and an enemy into his family as an adopted child. Live with profound thankfulness for God’s love for you and look for ways to share it with others. When we do it takes very little effort or motivation to reach out to lost people and say, “You need to come and see how wonderful my God is.” This kind of evangelism is exceedingly effective. When a believer looks an unbeliever in the eye and says, “Taste and see that the Lord is good” – these words have a way of striking a responsive chord in the lives of unbelievers. Contemplate the love of Christ for you and let his love for you overflow and become a contagious love for others. When you think about the people around you, who do you see? People who are a pain to live with? Or people for whom Christ died? Remember – If lost people matter to God so much ,that he sent Jesus to search for them, die for them and bring them home, then perhaps they should matter to us also. There is no greater thrill than having a person look you in the eye and say, “Thanks for answering my questions. Thanks for being patient with me. Thanks for loving me when I wasn’t particularly loveable. Jesus saved me but you led me to the cross where I found grace.” For nearly twenty years, Eric Liddell shared the love and grace of the Lord Jesus with Chinese people. Winston Churchill negotiated an exchange of prisoners but, typically, Liddell refused to go, giving up his place to a pregnant woman. If Liddell was in great pain in early 1945, he never really let on. Despite his illness, he simply continued to love and teach and train the children. But on 21st February, 1945, just months before the end of the war, he succumbed to an undetected brain tumour. He was laid to rest in a little cemetery outside the walls of the camp. Then, after the war, Liddell’s remains were interred in the Mausoleum of Martyrs at Shih-Chia-Chuang, 150 miles south-west of Beijing. Its there that China honours the memory of 700 people who made the ultimate sacrifice in the liberation of China from the Japanese. 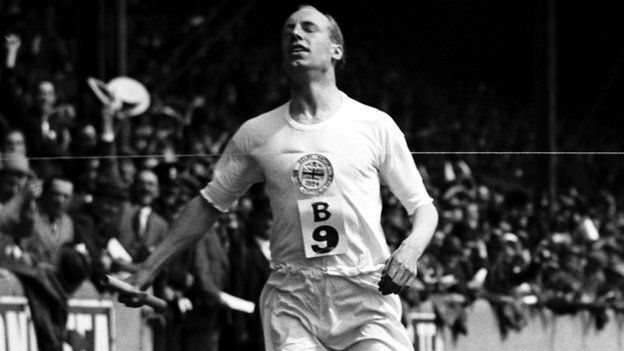 The record books may remember Eric Liddell the runner, but the people whose lives he touched remember him as a servant of Christ. A fellow internee, Stephen Metcalfe, later wrote of Liddell: “He gave me two things. One was his worn out running shoes, but the best thing he gave me was his baton of forgiveness. He taught me to love my enemies, the Japanese, and to pray for them.” Lets pray. Yes Lord I will follow you, help me to feel as you feel, to see as you see and the love as you love, help me to become contagious in my love for you that others may want to know and love you also. In Jesus name.